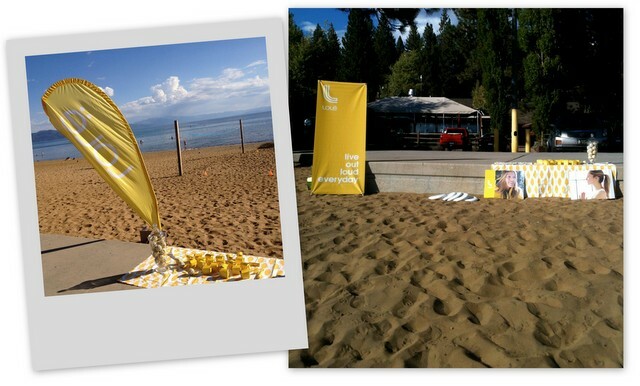 Join me (a Lolë ambassader) and Tahoe Lumber, Tahoe’s women’s ultimate frisbee team, for a special Lolë meetup on Friday September 28, 2012, on the sand across from Tahoe Mountain Sports‘ Kings Beach shop. From 4:30 to 7:30pm we’ll be out there playing beach ultimate and showing Tahoe ladies how to throw and play. Lolë is a Montreal-based women’s activewear brand, and I swear by their apparel. From bikinis to shorts to leggings, dresses and winter jackets, I’ve got a bit of everything from the brand and absolutely love the function and look of every piece. At this event I’ll be spreading the Lolë love, teaching interested ladies about ultimate frisbee, playing a beach game, and doling out some special gifts. Before, during and after the event, Tahoe Mountain Sports will offer a free gift with purchases over $75 and 15% off all Lolë clothing. Tell all your female friends about this meetup. You can share Lolë’s Facebook event page if you like! I am not a runner. Or at least that’s what I always told myself. I can sprint all day on an ultimate field, but get me on a trail and 3 miles was always my max. I once ran 6 miles. That was a big day. But something bit me this fall. Ultimate frisbee season was over, I had a few months of down time before skate skiing, and Tahoe’s snow was on a serious vacation (still is). So I started running. I downloaded the Runner’s World half marathon training guide, and began a 9-week process to turn me into a runner. I admit my half marathon goal may seem very small (especially when you compare it to all the people out there doing really big things—the Lolë president’s journey up Kilimanjaro, for one). But you’ve got to start somewhere and this was an attainable goal that I decided to do as much for the training as for the race itself. The other thing that amazed me in the process is that I enjoy running. Sometimes I’d dread heading outside, especially with Tahoe’s icy roads and trails, cold rain and frigid air as obstacles, but as soon as my feet starting hitting the ground I’d feel this sense of relief. Running became my relaxation, a place that I could meditate and let my mind stop churning. Things went great, except when I ran a faster-than-usual 5 miles on pavement in week 8 and some serious knee pain set in. I’m not sure if I’m cut out for this long-distance running thing, but perhaps I’ll just train longer and slower next time. 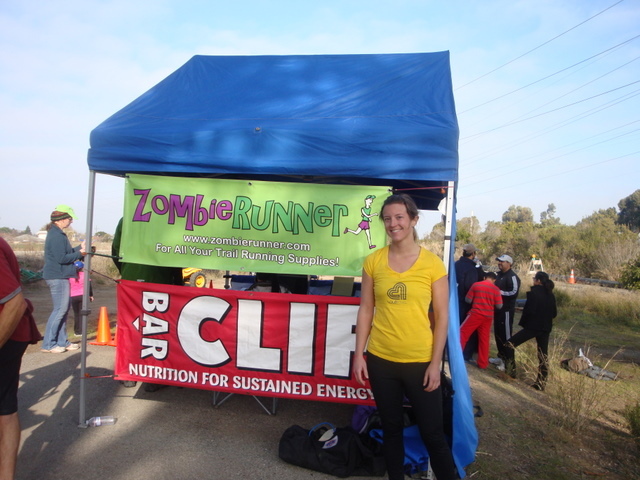 Knee pain and all, I finished the race though: the 2011 ZombieRunner Bay Trail Run. Mile 9 was the toughest for me. And next time I’ll avoid the Clif Shot, which did a number on my belly. But I’m happy to say that I finished in good form. My time was 2:10 so I ended up right in the middle of the pack: 24th in my age group of 47 women, and 106th out of 199 total runners. My pace was a 9:58-minute mile. the spoils from my accomplishment: a tech t-shirt, sopping wet hair, and a medal! Special thanks to the iMapMyRUN iPhone app, which helped me log all my miles, and to Lolë for outfitting me for the journey. Couldn’t have done it without your leggings!! I’ll be blogging about my favorite running gear on the Tahoe Mountain Sports blog soon. 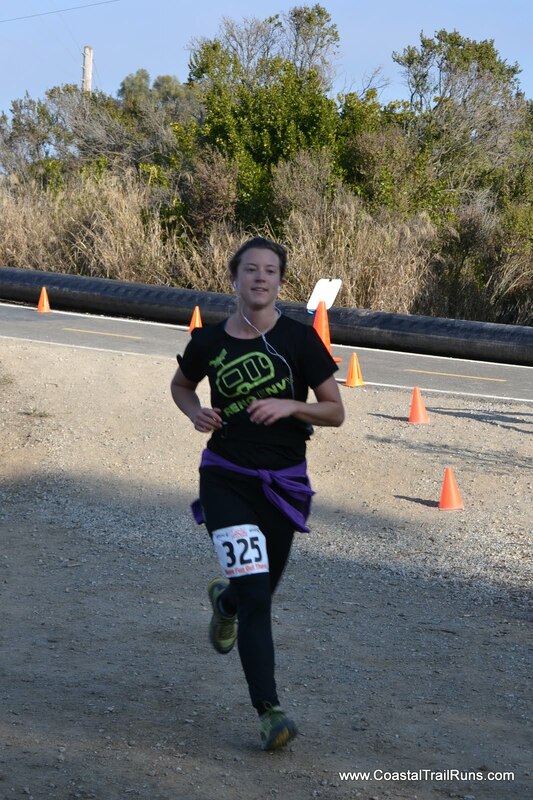 See photos of the Bay Trail half marathon course here. 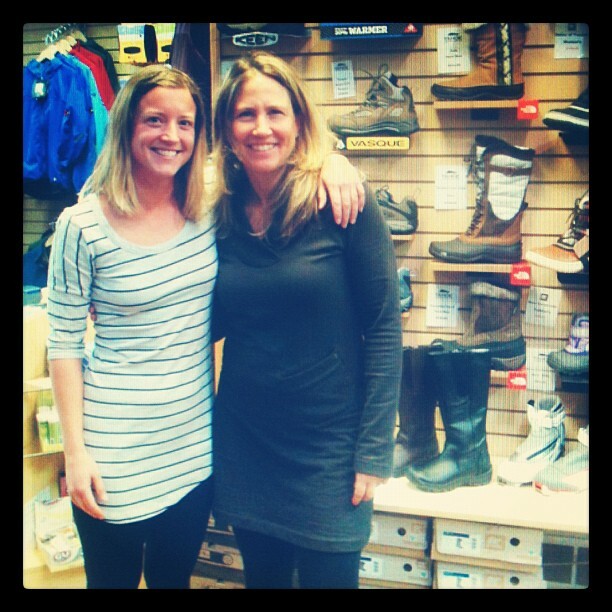 Me (on left) in Lolë’s Principle Tunic and Finalist Pants, Pam wearing the Calm Dress, at Tahoe Mountain Sports‘ Ladies Night on October 26th. More Ladies Night photos here. I’m kinda notorious for multitasking. Yeah, I somehow amazingly get lots of things done at the same time, but sometimes certain things get sacrificed in the process. If there ever was a time for me to get a wake-up call, TMS’s Ladies Night was it. I was feeling fresh in my new Lolë Principle Tunic, in the light gray color—a perfect contrast to the night’s free red wine. So there I was, chatting up the crowd, snapping pics, sipping wine… when (yes, it seems so accident-waiting-to-happen when I write it out now) I decided to balance my camera with my wine-holding hand. You can surely get the picture of what happened to my beautiful tunic. Lucky for me there was a Cooldown Cardigan in the wings. I changed, rinsed the wine off right away, then picked up some extra-strength stain remover on my drive home. I’m normally your eco stain remover kinda girl (this is on my laundry shelf), but for my new Lolë garb I didn’t want to take any chances (this is what I bought). And it worked. My Principle Tunic is reborn, and I’m gonna slow it down. …an awesome wardrobe! 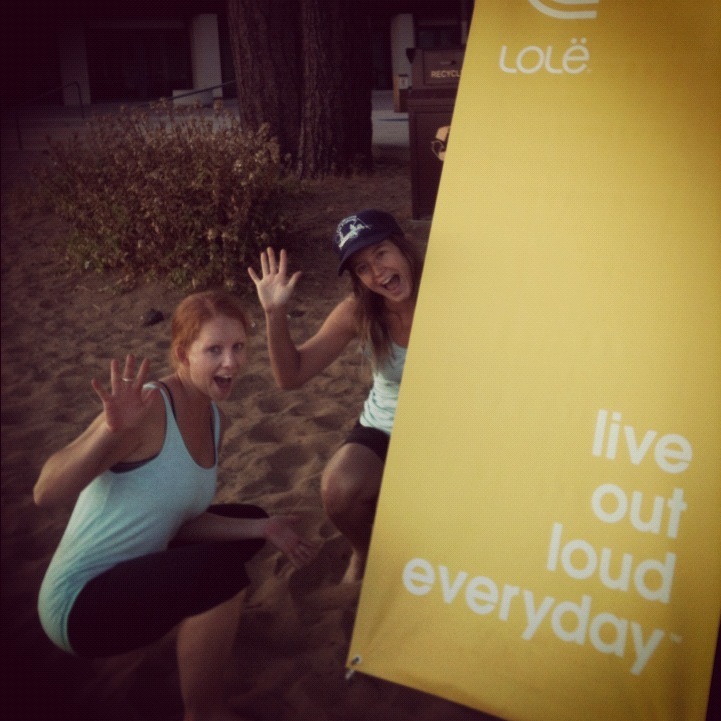 I am now a brand ambassador (or, Lolë friend) for Lolë, a Canadian fashion-tech apparel company for active women. Lolë is all about living your life to its fullest, and looking great while you do it. I’m stoked to be a part of the team and can’t wait to wear more Lolë. If you’ve seen me around Tahoe this summer, then you’ve already seen me in Lolë. My rocking orange bathing suit is the Lolë Bermude top and Mojito bottoms, purchased from Tahoe Mountain Sports’ Lolë inventory in Kings Beach. Look for my contributions to the Lolë blog and Facebook page, as well as my Tweets spreading my love for @LoleWomen. I’ll be updating you soon on some pieces I’ll be giving a test drive.